By now, many voters have heard that Mitt Romney once put the family dog, Seamus, in a crate and strapped him to the roof of a station wagon. But far fewer have heard that Romney and his sons once raced across a dark, placid lake on Jet Skis, “Baywatch”-style, to rescue strangers and their dog, McKenzie, after their boat capsized. Or that Romney once temporarily closed the Boston headquarters of his private-equity firm to round up his co-workers, accountants and lawyers and fan out across Manhattan to search for Melissa Gay, his Bain Capital partner’s missing 14-year-old daughter. Or that as a volunteer lay pastor of his Mormon congregation, Romney spent years counseling neighbors on their marriages and adoptions, helping the unemployed feed their families, and ministering to the sick and the addicted. What goes unsaid in these pieces, though, is that these anecdotes are not necessarily the hidden golden gems they are made out to be. Start with the rescue on New Hampshire's Lake Winnipesaukee. A good story to tell at summer BBQs, to be sure. But a campaign trail standard? I don't know. For a candidate who is trying to play down his extreme wealth, I'm not sure it's such a good idea to be reminding voters of your $10 million, 5,400 square foot New England lakeside estate, which sits on 11 acres and apparently has enough jet skis lying around that you and your sons can zip out on the "placid" waters when you see some trouble afoot. The story pretty much screams noblesse oblige. As does the tale of Romney suspending operations at Bain so that he and his fellow private equity hawks could go hunting for a colleague's daughter in the wild streets of crack-era New York City. That anecdote is a bit more compelling than the Great Jet-Ski Rescue, but it's not exactly untold -- Romney's campaign ran an ad about it in 2008, which his Super-PAC this year appropriated for its own commercial (thereby skirting FEC rules against overlapping efforts between the campaign and Super-PAC.) Regardless, I'm not really sure what the point of this story would be, from a campaign perspective -- that Romney was so big-hearted that he was willing to stop making a ton of dough for a few days to help out a worried colleague? This bring us to the third potential anecdote -- how Romney "spent years counseling neighbors on their marriages and adoptions." Um, I definitely know why Romney wants to steer clear of this one. 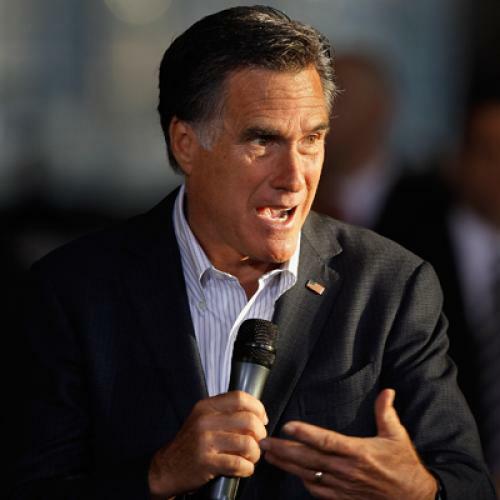 For starters, it reminds voters about his Mormon faith, as do his tales of his mission years in France -- something Romney is plainly ambivalent about doing. More importantly, though, it risks reminding people what his "counseling" sometimes consisted of. In their new biography of Romney, Michael Kranish and Scott Helman recount in detail some of the more eyebrow-raising counseling sessions Romney provided. There was Peggie Hayes, a Mormon who, at age 23, was raising her daughter on her own and became pregnant again. Romney, the bishop of her local ward, had been helpful, arranging her to do odd jobs for cash. But then he showed up at her apartment one day and out of nowhere started talking up the church's adoption agency. "Hayes was deeply insulted. She told him she would never surrender her child," the authors write. They quote Hayes: "And then he says, 'Well, this is what the church wants you to do, and if you don't then you could be excommunicated for failing to follow the leadership of the church.'" After Hayes' son was born, he needed risky surgery to separate bones that were fused together in his head. Hayes asked Romney to come to the hospital to confer a blessing, but he sent two other people in his place. "I needed him," the authors quote Hayes as saying. "It was very significant that he didn't come." In 1990, Exponent II, a Mormon feminist magazine that [Judy] Dushku, [a] Suffolk University professor, helped found, published an article by a married mother of four who recounted her own experience after doctors advised her to terminate her pregnancy when she was being treated for a potentially dangerous blood clot. Her bishop got wind of the situation, she wrote, and showed up unannounced at the hospital, warning her sternly not to go forward. The article did not identify Mr. Romney as the bishop, but Ms. Dushku later did. Ms. Dushku sees hypocrisy and callousness; Mr. Scott sees inexperience. No, somehow I don't think these sorts of anecdotes are going to do the trick for the candidate -- especially one already facing a big polling gap with American women.